Oak Flats Anglican | Are you good enough to be forgiven? You are here: Home » Blog » News Sheet Blurb » Are you good enough to be forgiven? Are you good enough to be forgiven? Are you the kind of person who would be acceptable to Jesus? In Luke chapter 7, we read about a dinner that Jesus attended at the house of some very religious people. 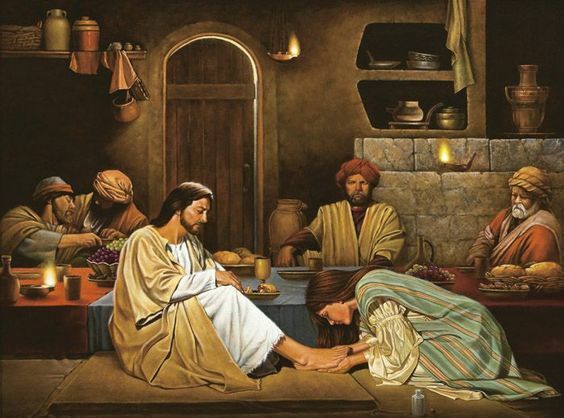 While they’re having dinner, a woman comes into the room, and starts washing Jesus’ feet with her tears, kissing his feet, and pouring perfume over his feet. But there was something even stranger about it, and that was the kind of woman this woman was. This woman was a public sinner, maybe a prostitute, and this religious guy thought that Jesus must have been clueless to have anything to do with him. Because if Jesus was really a prophet of God, then he wouldn’t have had anything to do with such a godless woman, and what’s more, he’d have the supernatural powers to know that she’s the kind of woman who religious people stay right away from. But Jesus is more than a prophet: he is God, himself, and he knows everything, including how sinful she really was. And yet, she came to Jesus, showed her love and adoration to him, and he totally forgave her. Jesus didn’t just know that her sins were forgiven, he did the forgiving himself. All she did was come to Jesus and seek his forgiveness. And so, if Jesus will forgive this sinful woman, he offers to forgive anyone like you and me.